Jewelweed leaves emerge from the soil in early spring, the plant continuing to grow and mature until it finally begins to bloom in mid-to-late summer, and on through early fall. The name ‘Jewelweed’ has a few explanations, but the one I like best is that it’s a reflection of the fact that the surface of Jewelweed leaves causes water to bead up, glistening like a jewel. 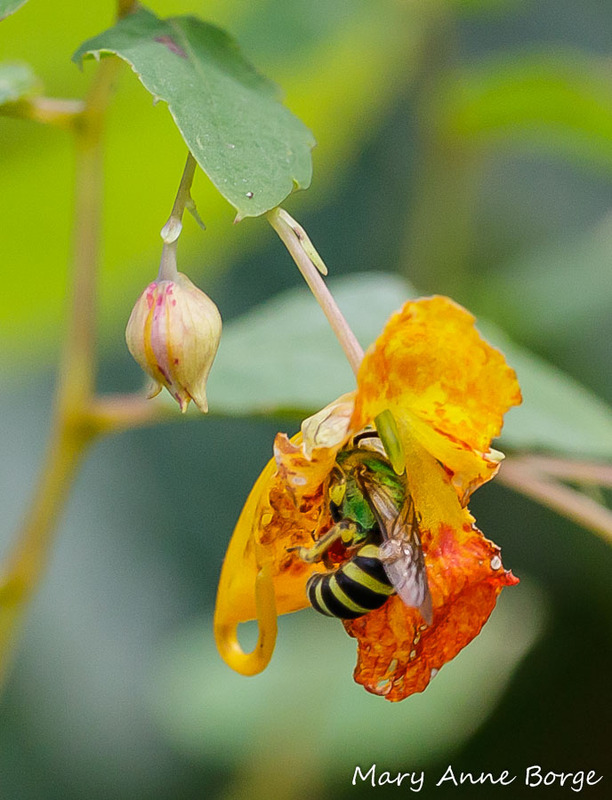 Jewelweed (Impatiens capensis) with Sweat Bee (Halictid species). Notice the jewel-like drops and silvery sheen of water on the leaves. 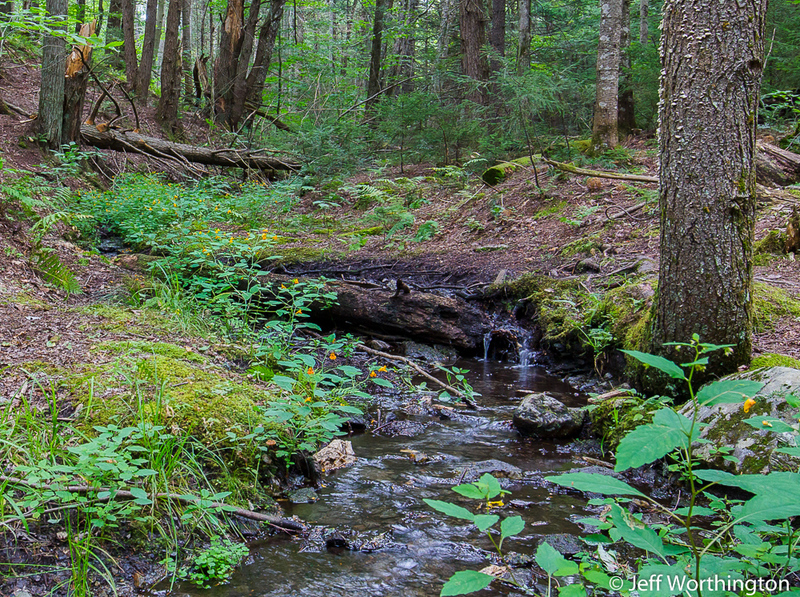 There are two Jewelweed species that are common in eastern North America. One has orange flowers with dark reddish-orange spots or lines at the throat. 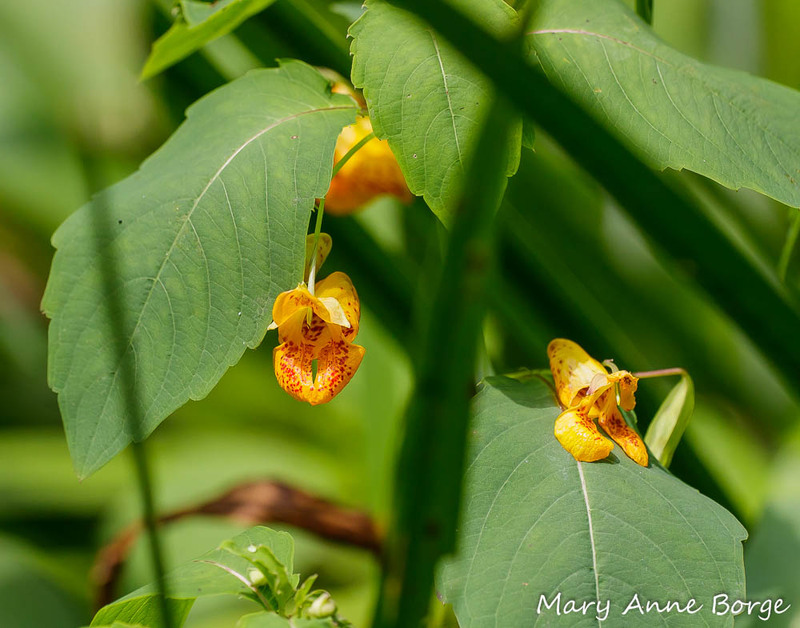 Some common names for this orange-flowered species are Jewelweed, Spotted Jewelweed, or Spotted Touch-me-not (Impatiens capensis). 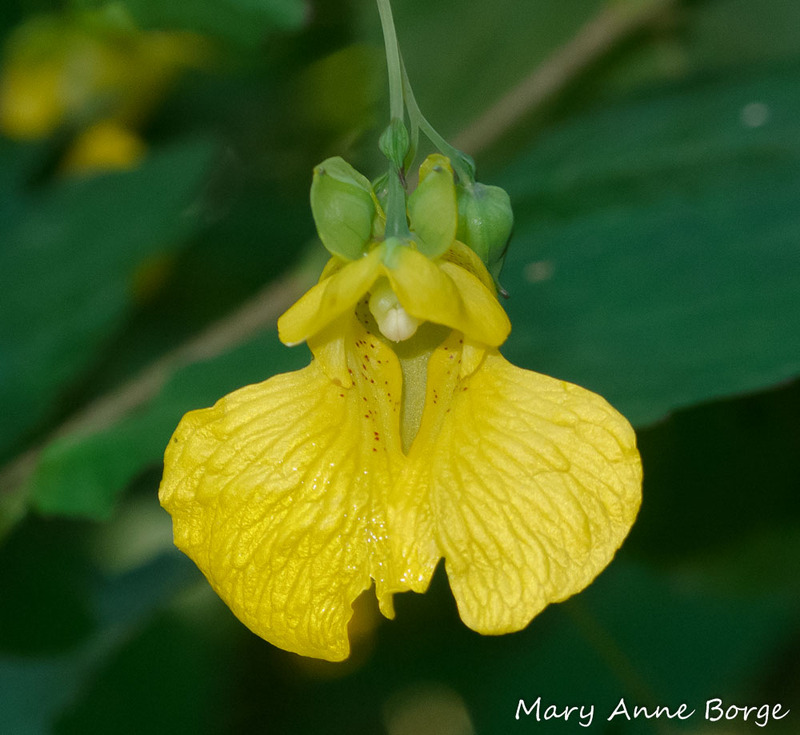 The other species has yellow flowers, sometimes with reddish-brown dots at the throat, and is known as Pale Jewelweed, Yellow Jewelweed or Pale Touch-me-not (Impatiens pallida). 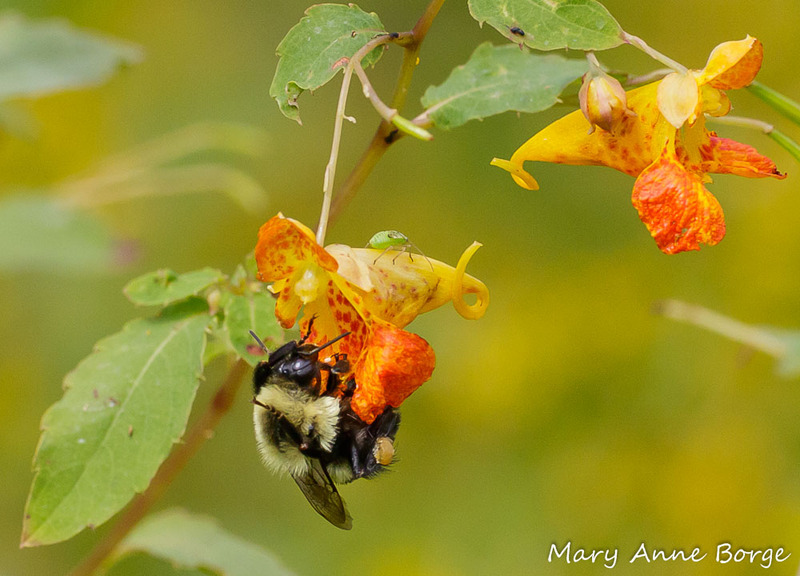 These Jewelweed species are annuals, meaning that each plant dies at the end of the growing season. In order for the species to continue to survive, it must produce seeds each year. 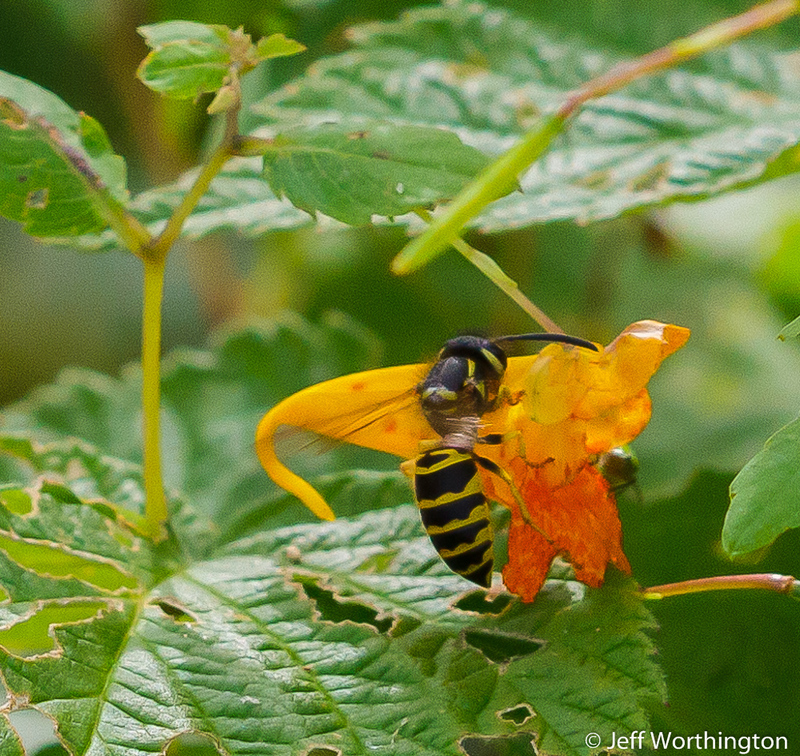 Jewelweed has two strategies to make sure that happens. 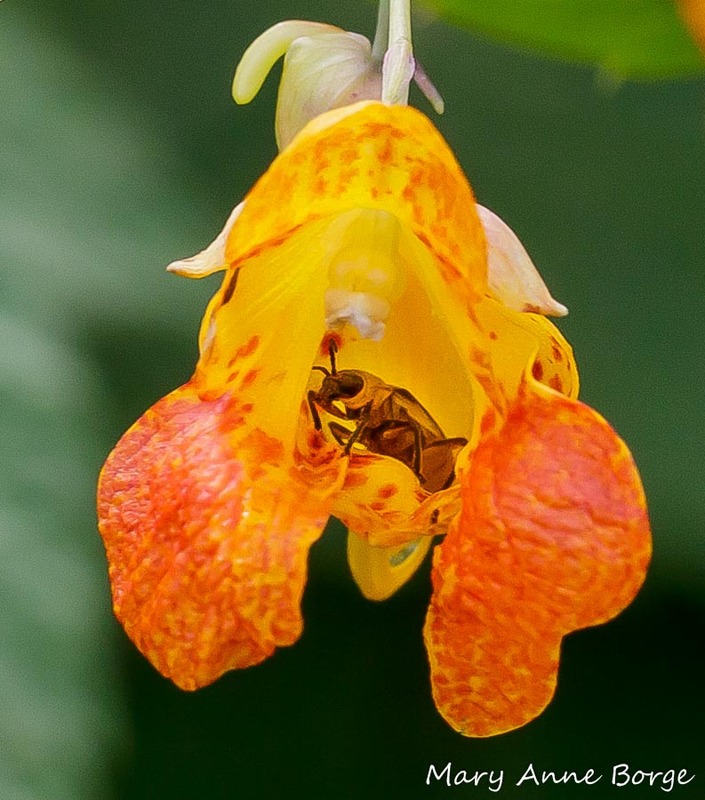 Jewelweed’s primary strategy for reproduction is to produce showy flowers that will entice animals to visit, and transfer pollen from one plant to another, successfully achieving cross-pollination. 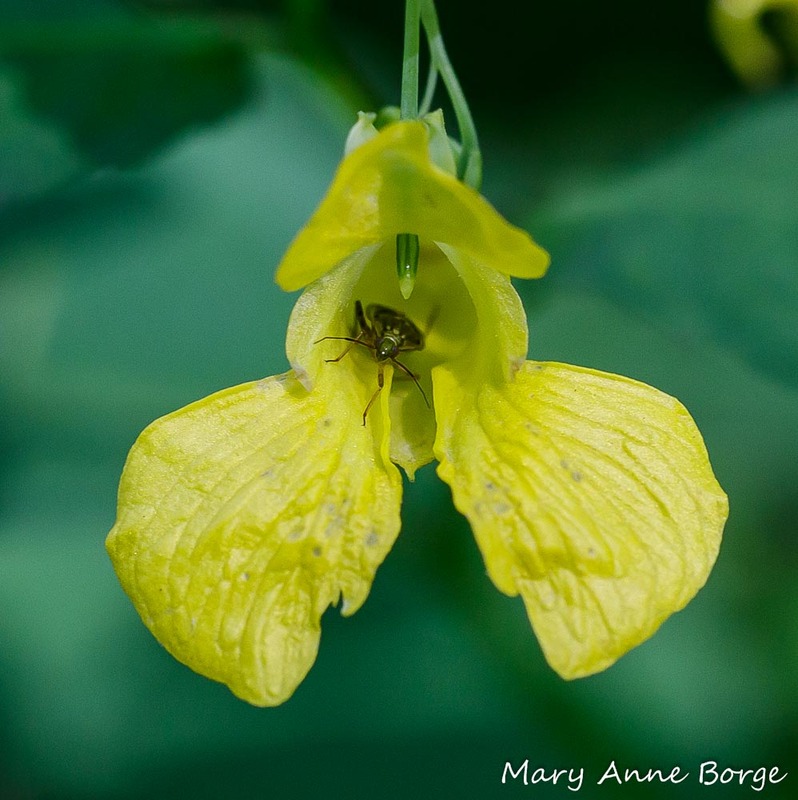 When Jewelweed flowers open, their male reproductive parts (the stamens), mature first, making pollen available for transfer from the anthers at the stamen tips. Later, the stamens wither and are replaced by the female reproductive parts (the pistils), the receptive stigmas at their tips waiting for a flower visitor to brush them with pollen. 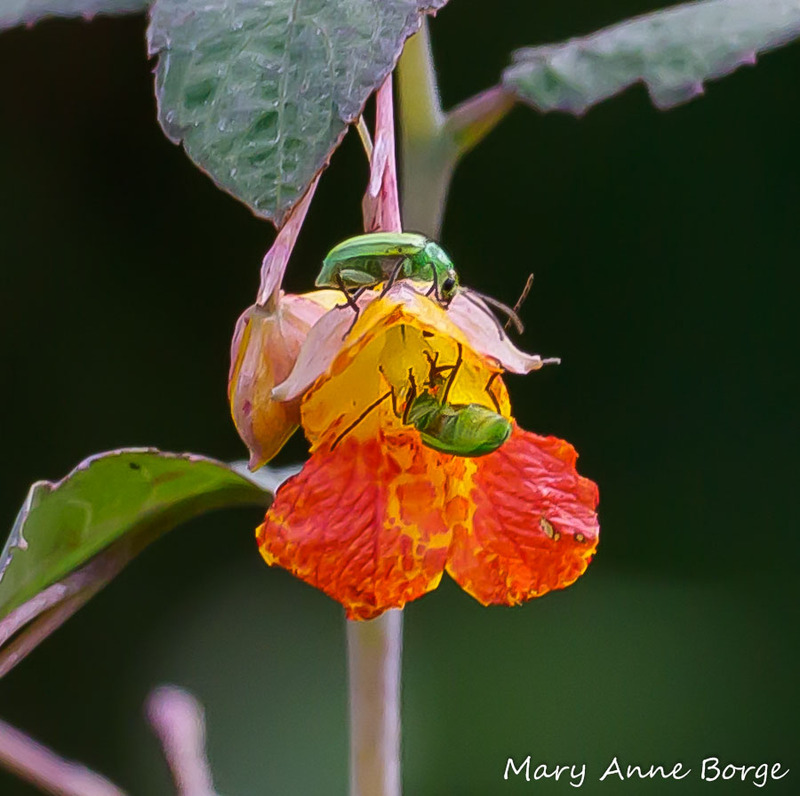 These beetles are interested in consuming floral tissue, and are probably not very helpful in assisting Jewelweed in attaining its pollination goal. Given their anatomy and feeding style, Bumble Bees are among the most likely to help successfully pollinate the flowers. They are the most frequent visitors to Pale Jewelweed. Even in the insect world there are individuals who like to cut corners and get something for nothing. There are insects that cheat, chewing through the spur to directly access the nectar. 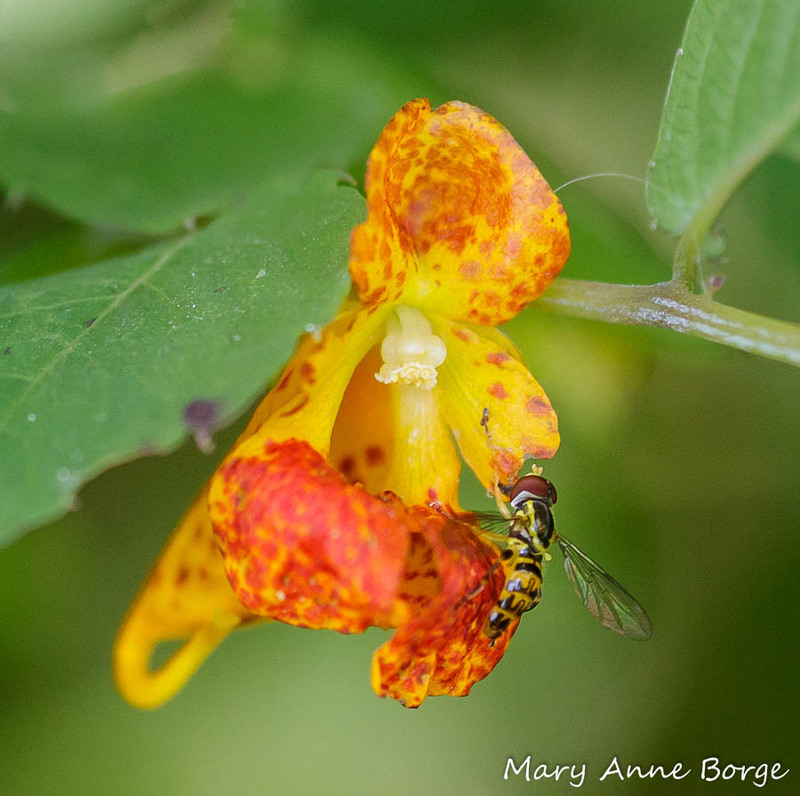 These insects by-pass the flower opening and its reproductive parts, so they’re no help to Jewelweed in its pollination mission. Ruby-throated Hummingbirds are valuable pollination partners for Jewelweed. 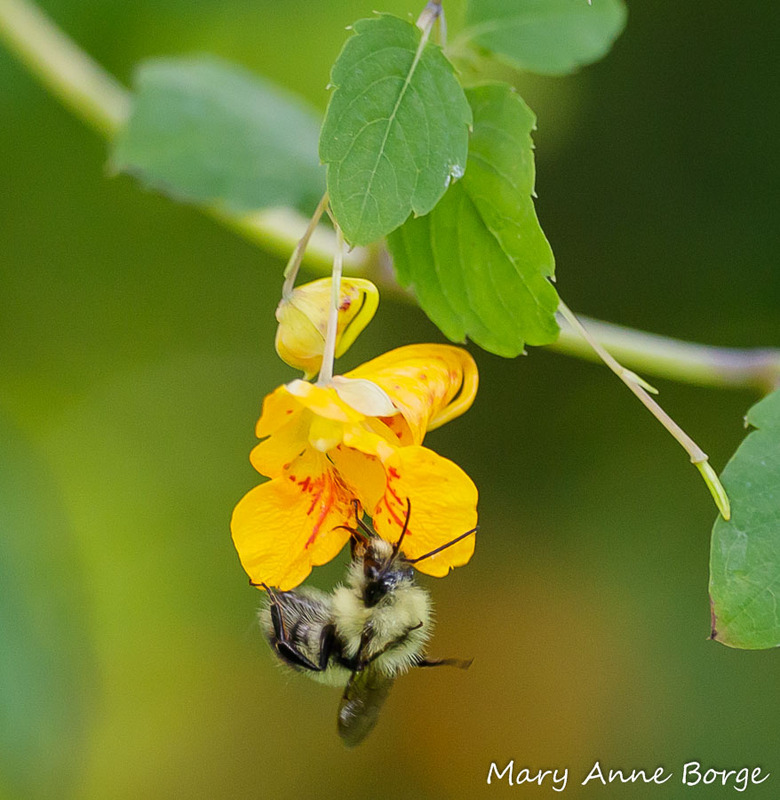 As these energetic little birds move from one Jewelweed flower to another, they are likely to pick up pollen on their heads as they brush against the anthers at the inside top of the flower entrance, subsequently depositing the pollen on the stigma of another flower. 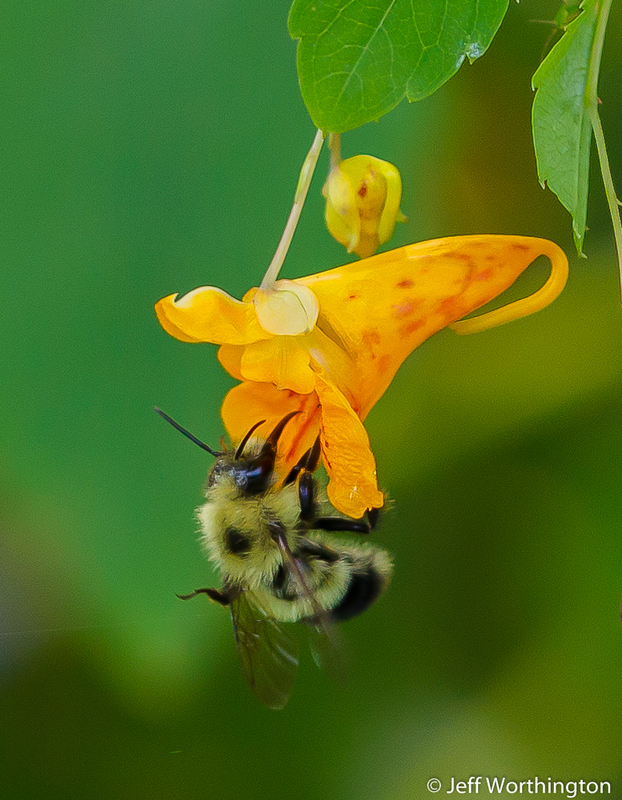 In return, Jewelweed provides an important nectar source for them in late summer and early fall. The name ‘Touch-me-not’ reflects the explosive spring-action opening of ripe fruit capsules. The slightest touch will trigger it, projecting the seeds for a distance of several feet. Animal seed eaters include Ruffed Grouse, Bobwhites, mice and shrews. 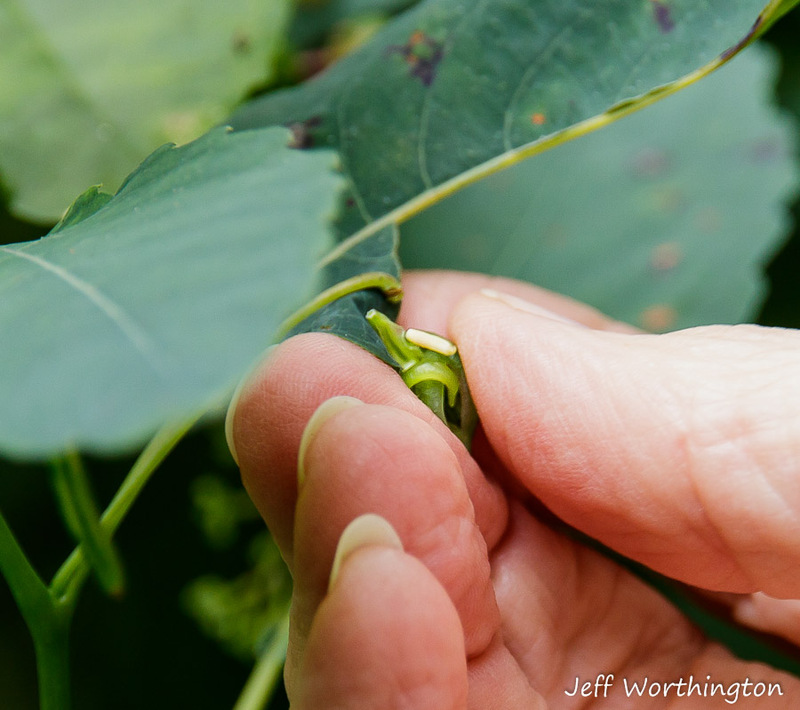 Jewelweed also has a back-up plan for producing seed, one that doesn’t rely on the assistance of a third party for pollen transportation. 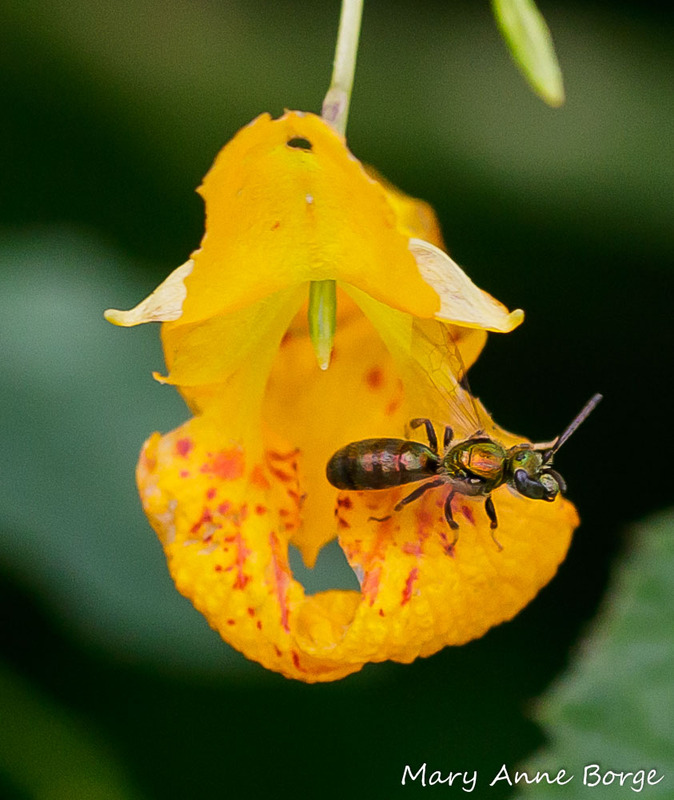 In addition to the showy flowers that entice pollinators, Jewelweed produces cleistogamous flowers, a type of flower that doesn’t open and is self-fertilized. When the fruit capsules produced from these flowers open, the seeds fall in the vicinity of the parent plant. 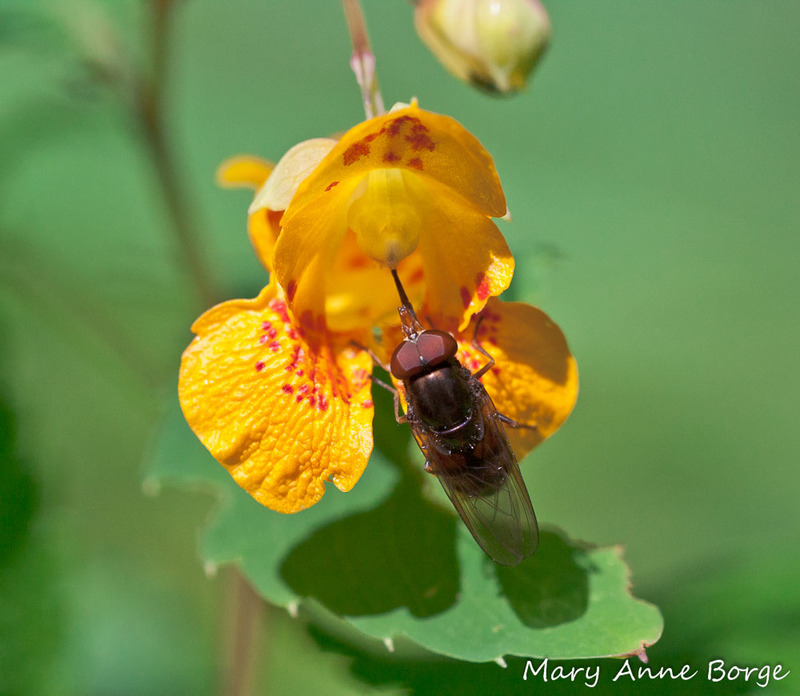 The combination of the two types of flowers may allow Jewelweed to hold its existing territory, and extend it a bit. Jewelweed contains lawsone, a compound with antihistamine and anti-inflammatory properties. 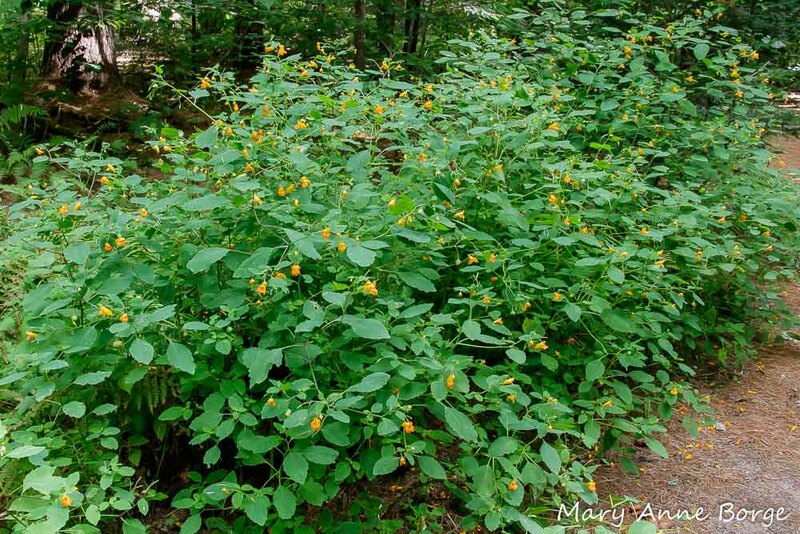 Jewelweed has been used to treat poison ivy exposure, and stings from stinging nettle and insects. 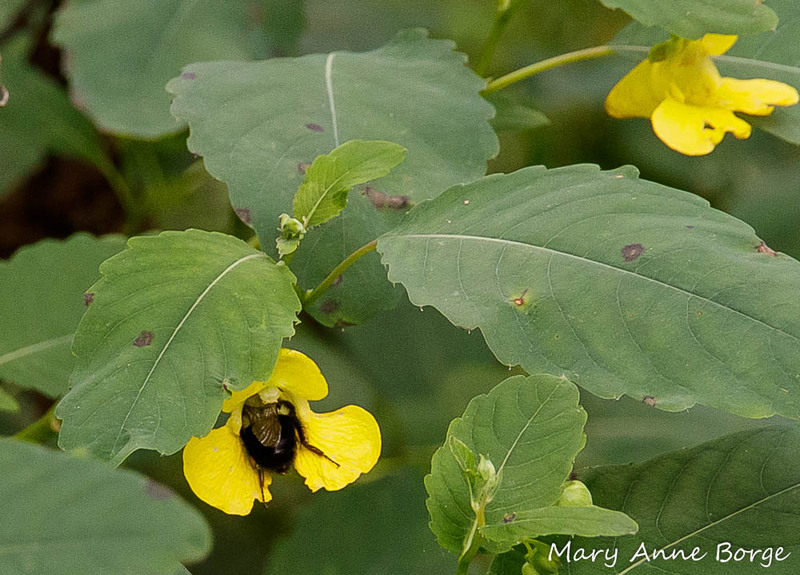 Jewelweed prefers moist soil, and is often found along streams, in wet meadows, roadsides, swamps and open woods. It may establish a large colony, with individual plants often growing to a height of 5 feet (1.5 meters). 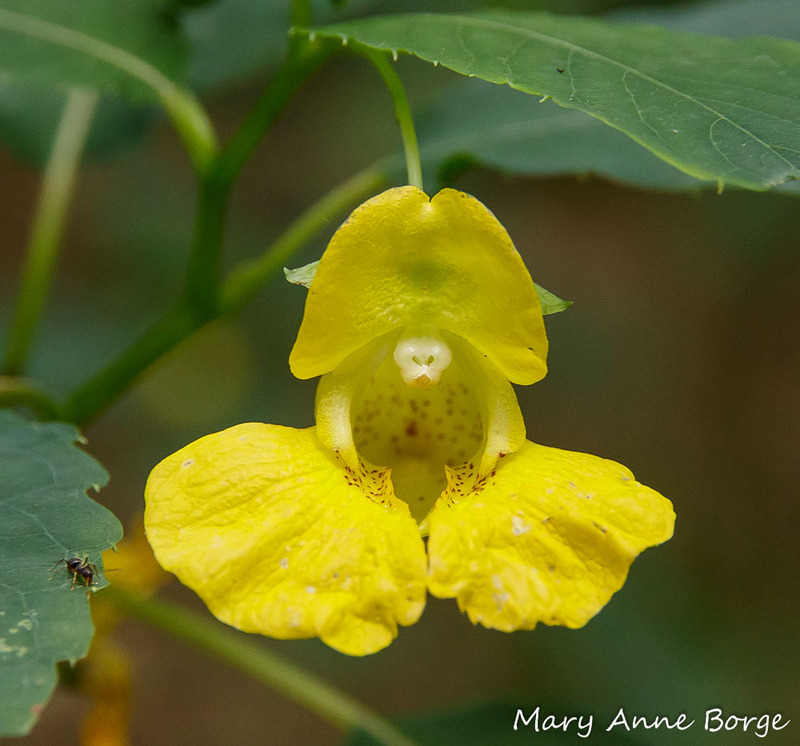 The orange-flowered Jewelweed’s (Impatiens capensis) range includes the eastern two-thirds of the United States plus Idaho, Oregon and Washington, and all Canadian provinces and territories, except Nunavit. Pale Jewelweed (Impatiens pallida) is less common, and more of an eastern species. It can be found from Newfoundland and Labrador, west to Ontario and eastern North Dakota, and as far south as eastern Oklahoma and South Carolina. Eastman, John. The Book of Swamp and Bog. 1995. Evans, Arthur V. Beetles of Eastern North America. 2014. Moerman, Daniel E. Native American Ethnobotany. 1998. 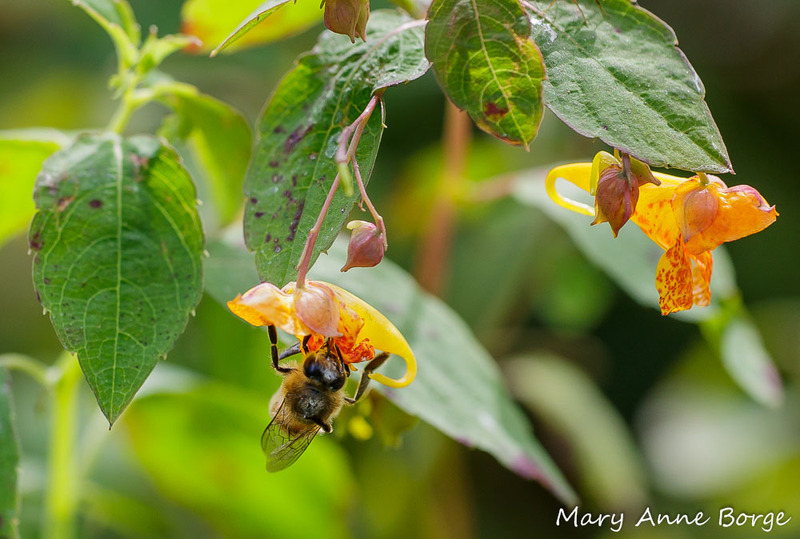 This entry was posted in Birds, Gardening for Wildlife, Medicinal Plants, Native Plants, Nature, Other Insects and Spiders and tagged Impatiens capensis, Impatiens pallida, Jewelweed by Mary Anne Borge. Bookmark the permalink. Your site is beautifully done and much appreciated. Thank you! I’m glad you enjoy my site. 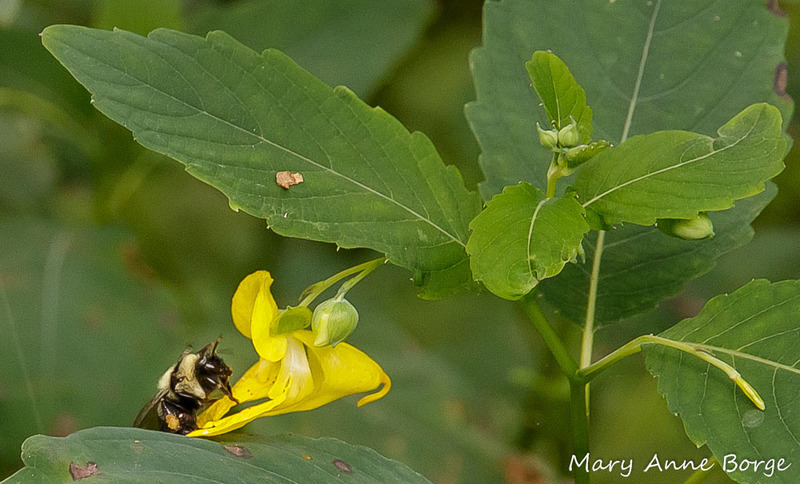 Enjoy your Jewelweed! Very informative and looks an amazing plant . The photos are so clear. Not sure we have an equivalent to jewel weed here in Southern Spain. Will check the books! Impatiens noli tangere is the European one but it is found in damp places so think as we are in the south of Spain it is usually too dry. Also related to Himalayan balsam which is considered invasive as it clogs up river banks in the UK. And very damp there! It seems your jewel weed was introduced to Europe for gardens but will grow wild, but haven’t seen it myself. The problem with introducing a plant to a part of the world where it didn’t evolve naturally is that its natural predators are usually absent, so the plants can become invasive. Lovely though they may be, they are less likely to help the local animal population, whether pollinators or seed dispersers. Love this post. Can’t imagine my yard without Jewelweeds. 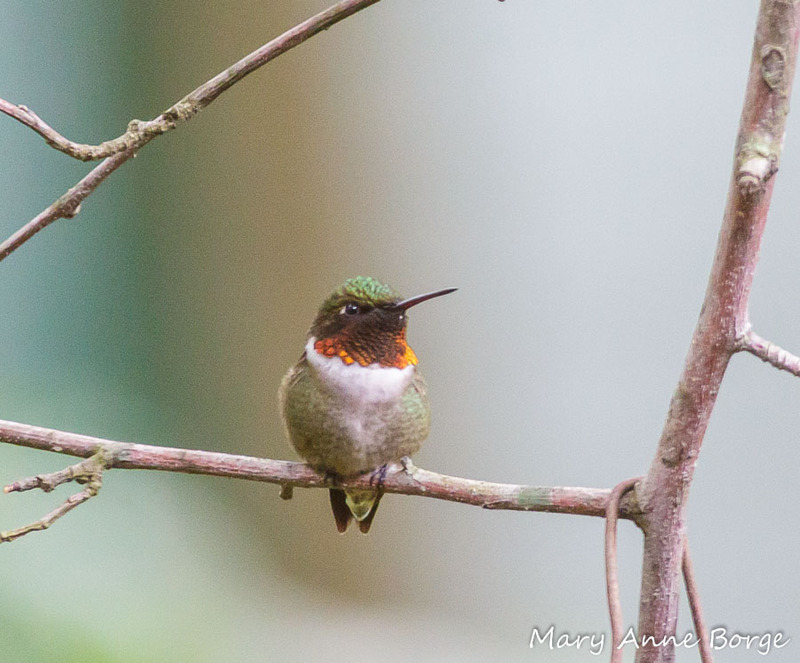 The first plants my hummingbirds go to when visiting my yard. Hard to believe I received a “code violation” for having this noxious weed in my yard. 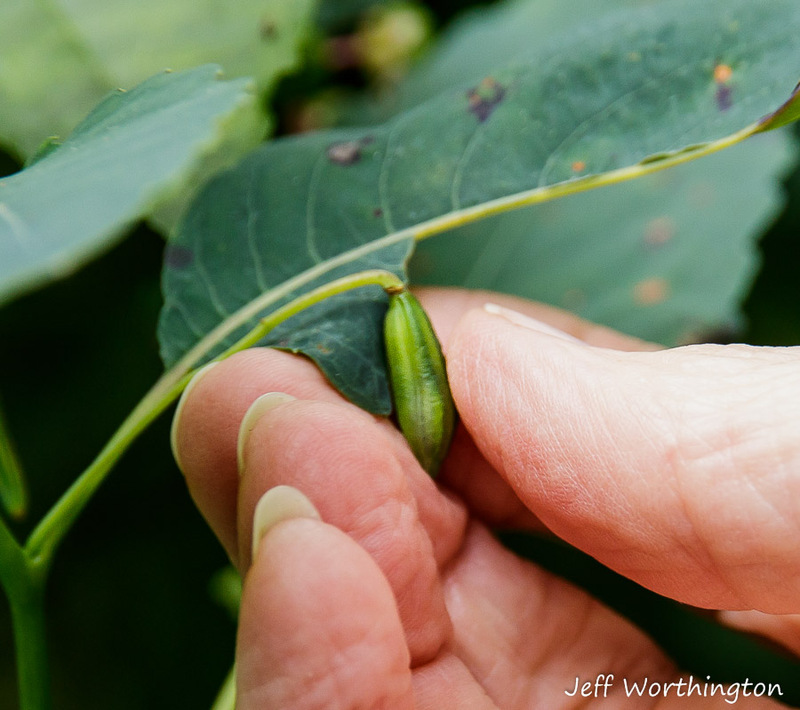 The code officer believed that the “touch-me-not” in my yard is “closely related to poison ivy.” He went on to explain that is why it is called “touch-me-not.” With ignorance like that I didn’t know where to begin. Guess I need to find a new place to live. Maybe this could be an opportunity to change the code. Do you have an Environmental Advisory Committee you could work with? Mary Anne, a fabulous shot of the dispersal of the seed. I will be heading over to the Marsh soon for a closer look. Your work is a much appreciated gift. 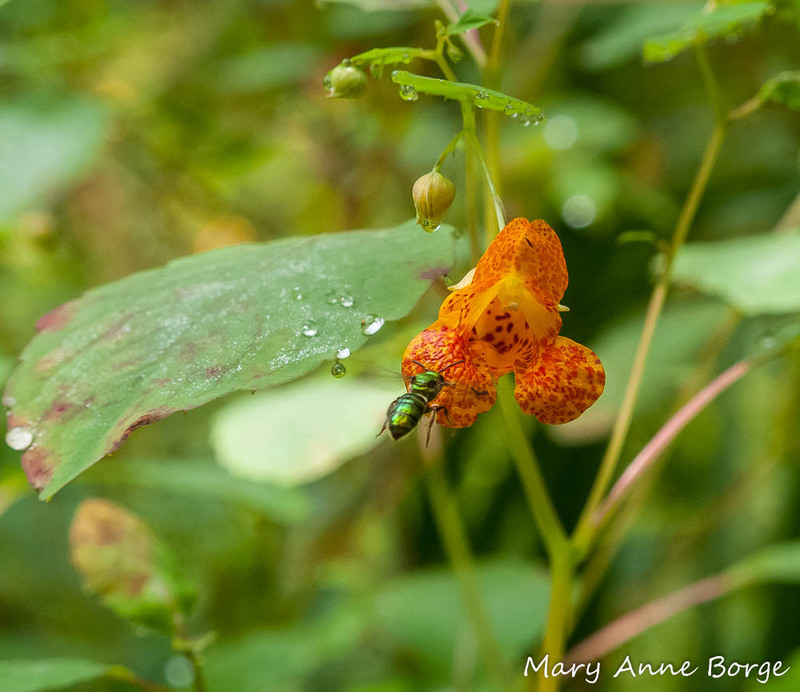 There’s still plenty of Jewelweed blooming, and time to enjoy it. Interesting post and beautiful photographs!